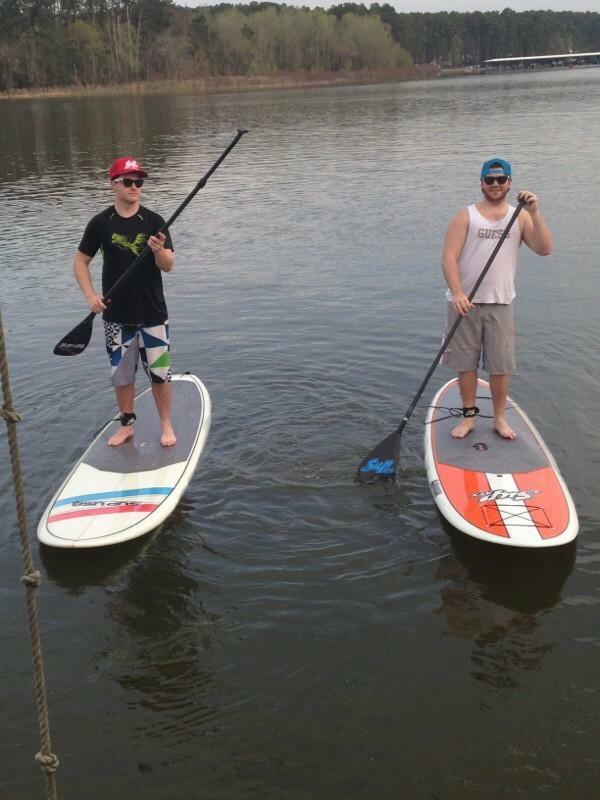 SUP Triple Rack with Paddle Holder. This is a very solid Paddle Board Wall Mounted Rack. It is made from steel and can hold 50lbs on each of its 3 storage levels. The 4th shorter level is made to hold all your paddles. This looks great on the wall, it has a slight angle to really show off your boards. It works well as a retail display rack too. This Stand Up Paddle Board Rack is specially coated in a multi step rust prevention process that will withstand moist conditions. This rack works great in the garage or on the patio. Each arm is padded with high density foam that protects your paddle board from any scratches while in the storage rack. This paddle board rack is built with removable arms, so when you are not using it you can take the arms off for space saving. This Paddle Board Rack is made to hold most SUP boards. 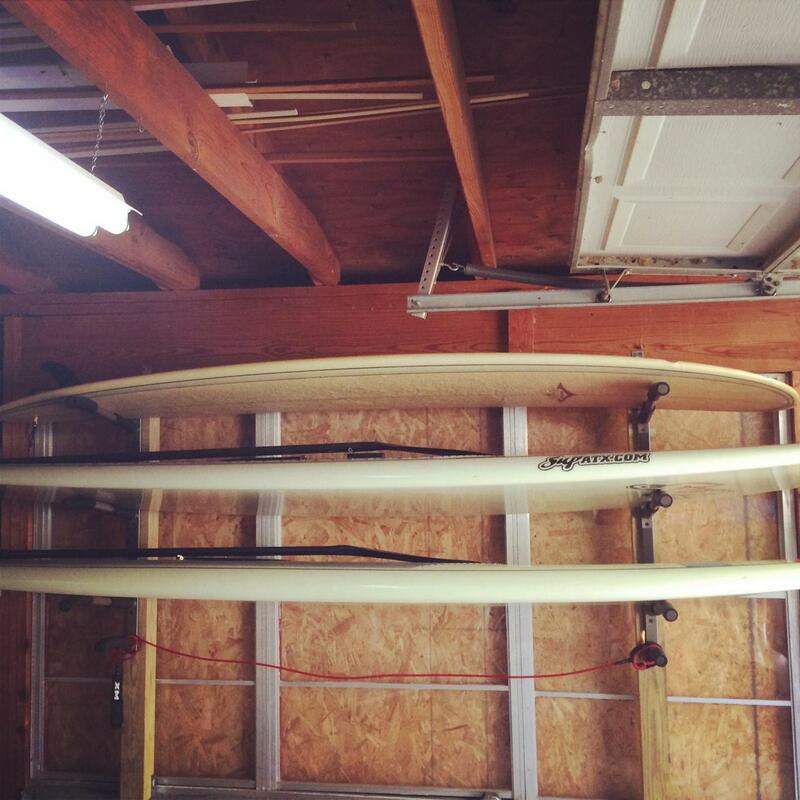 Each arm is 22" long which allows SUP boards up to 35" wide to be stored. There is also adequate spacing between the level, 11.5 inches, which will fit very thick SUP boards and some types of fins as well. If you are using the rack for surfboards or wakeboards you could stack a few boards on each level. Each rack level can hold up to 50lbs. The limitation if often more so your mounting surface rather than the rack itself. In general it is best to keep the total rack weight to under 75lbs. If you have it anchored to a very solid surface you could probably take it over that but you would need to make a judgement call on this. Can't wait for this product? Check out the Double SUP Rack instead. Could you hang 1 paddleboard and 1 kayak on this rack? If not do you have any suggestions what type of rack could? Would you recommend this rack for outdoor use? I live adjacent to a salt water beach. This triple SUP rack would not be the best option for your environment. It would most likely eventually rust in those conditions. One of your best options would be this Dock and Pier SUP rack , which is available with options for holding up to 3 boards; it is marine grade for a salt-water environment, and while its mountable to a dock or pier, it doesn't have to be -- you could set it up on a deck or a patio, or you could just lay down some 2x4s or 4x4s in the grass/sand, and then attach the racks to them. Another alternative for use outdoors in your area is this stainless steel SUP rack. Does this rack require assembly? Our triple steel SUP rack requires minimal assembly. You just slip on the arms to the base plate, no tools required. There is a little spring loaded "button" that locks them in place. Are the arms on this rack flat or angled. On one picture they appear to have an angle and on one picture, they appear to be flat. The arms on the SUP triple rack are angled. Do you make a rack to hold 5 or 6 paddle boards? We don't have a metal 5 or 6 board SUP wall rack, but we do have a couple of metal 5 board options that are freestanding, including this 5 board rack or this freestanding rack that can be purchased with 6 levels as an option. The spring-loaded buttons don't extend fully to properly engage and strengthen the storage arms. Decals are crooked and have air underneath them. For the amount I paid, I usually get a higher quality product. I'm sticking with Suspenz products from now on. I bought two and liked them enough I bought two more. Its great for my surfboards, but I would like slightly longer rods for some of my SUP's. 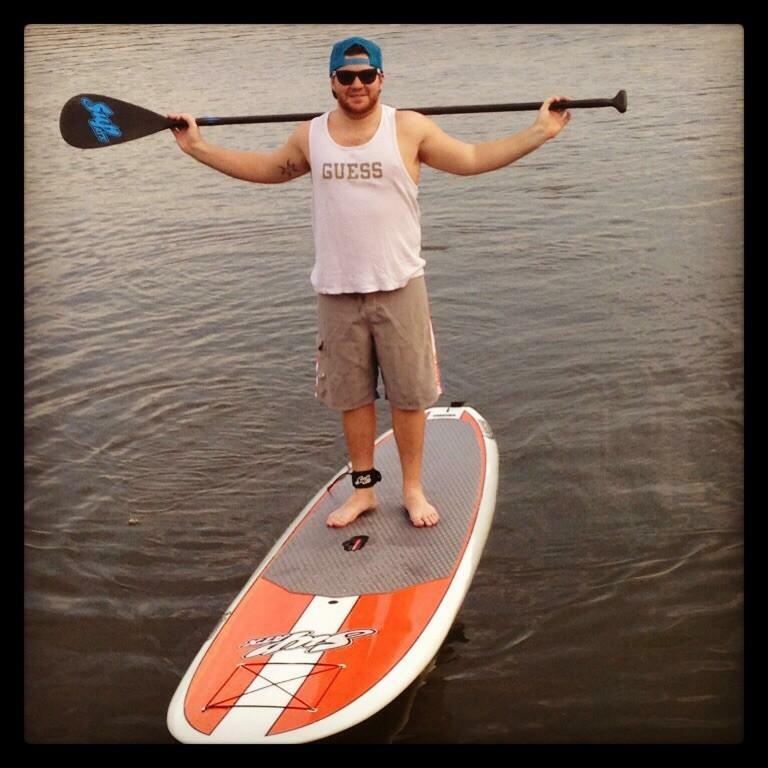 I am a big guy (265# 6'2") and have a 34" SUP for surfing, and a 32" kayak style SUP. The rack is not quite deep enough for the 34". But I am using the other two racks I bought for my car surfboard racks, to store them in garage, and car bike racks, so I love the racks for everything except the widest SUP. Totally as advertised. Easy to install, sturdy and sharp looking. This is a space saving must. I purchased this for my son's SUP and surf boards. He mounted it in the garage with ease and it is very sturdy. Only had six bolts and the arms that hold the boards are pre padded with a high quality foam. Great product! Well made, well priced. Easy to install.